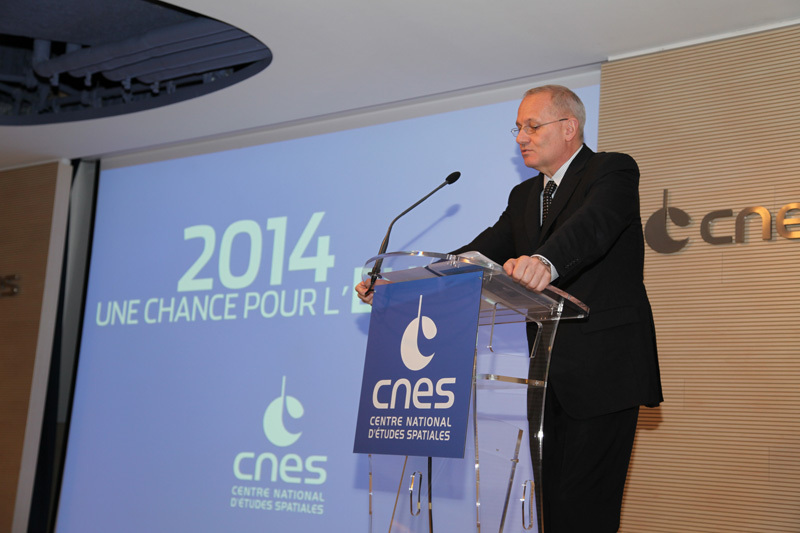 CNES President Jean-Yves Le Gall delivered his New Year wishes to the press at head office in Paris on Monday 6 January. He took the opportunity to chart the agency’s course and the challenges that await it in the year ahead. CNES President Jean-Yves Le Gall delivered his New Year wishes to the press at the agency’s head office in Paris on Monday 6 January. Credits: CNES/S. Charrier. CNES faces many other challenges in the year ahead. Flagship projects include: in defence, Athena-Fidus, set to launch in January; in telecommunications, the electric-propulsion satellite, one of 34 projects selected under France’s NFI new industrial policy; in Earth observation, IASI-NG, a shining example of successful cooperation between CNES, ESA and Eumetsat; in sciences, Rosetta, scheduled to reach comet Churyumov-Gerasimenko after a 10-year journey in November and put the Philae lander on its surface; and for Ariane, the future Ariane 6.